Grow a garden. If you have the space, consider growing your own garden. You will have an abundance of fresh, organic produce growing in your back yard, and food doesn’t get any fresher than that. Eliminate the chemicals and the long transportation time that your produce often endures to get to the grocery store shelves. If you live in the city or don’t have room to grow a garden, consider getting a plot at a community garden. Community gardens are designated locations that usually have 15 to 40 plots available for members of the community to garden. You use a plot and plant what you would like. You just have to agree to maintain your plot and water it at least once a week. There is often a small fee. The community garden I plan to use this summer charges $20, but that money is refunded at the end of the season if you have tended your garden throughout the season. Subscribe to a CSA. CSA stands for Community Supported Agriculture. Many CSAs offer organic produce and deliver it to a location near you every week. Programs often let you choose between a 1/2 bushel and a bushel of produce weekly or every other week and typically run for 18 to 22 weeks. In return, you must pay for your share upfront, usually before May. In larger cities CSAs fill up quickly, so you may want to begin looking for a CSA in your area this month or next month. 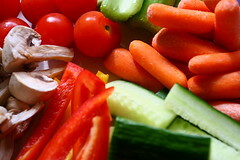 You also usually are not given much say in the produce you receive, so being open to trying new vegetables is necessary. Freeze Your Excess. If you have grown your own garden or have a share of a CSA, you may find yourself with an abundance of fresh produce during the summer months. Rather than letting it go to waste, consider preserving some of it. True, you could can some of it, but I have done that before, and it was a miserable time. (This is just my experience; you may enjoy canning.) Instead, take advantage of your freezer. Shred the excess zucchini and put it in the freezer in small bags. Puree excess squash to sneak into baked goods during the winter. Make Jamie Oliver’s pasta sauce and freeze it for future spaghetti or pasta meals. With careful planning during the rest of the winter months, you will be able to not only enjoy fresh produce during the summer and slash your grocery bill, but you will be able to save some of that produce for the fall and winter months, effectively lowering your grocery bill for produce all year long. We have a couple of summer meals that rely heavily on basil. My wife actually grows a basil plant which is much cheaper than buying what we need throughout the year. We’ve thought about a garden but haven’t moved it up the list in terms of priority for time and cost. We joined a CSA a few years ago and was very satisfied…although I found that it cost more than I expected and I could have saved money by going to the store. We do grow our own potted-garden. That was pretty awesome and we frequent the Farmers Markets around here quite a bit. Those are generally much cheaper than the grocery stores! These are some great ideas. My family and I don’t do any of these tips. I’m going to have to get on the ball. Thanks! It is tougher for a single guy like me. I don’t have a yard, so no garden. Also, buying anything in bulk is out because it would go bad by the time I get around to eating everything. On the bright side, being single, I don’t have to spend money on other people so a little extra food cost isn’t a big deal. I’m in the same boat as Eric. Freezing veggies really doesn’t work for me as they lose a lot of their texture and firmness when they defrost. Frozen veggies work pretty well for me in many instances, especially when it’s just the veggies and not preserved in any way, and are much better than freezing fresh ones. Could be that I’m just doing it wrong (I don’t have a vacuum system or anything). Eric–Maybe you could make a meal with the veggies like a soup or burritos, something like that, and then freeze the whole meal. Veggies seem to stand up better that way. I agree, too often if I just blanch the veggies and freeze, they don’t taste good once they are defrosted. Step 2: Repeat the eat meat. Step 3: Use your feet to get more meat! Step 5: Yes, I would like a peanut. @ Eric That’s about the exact same way I feel about soups. Normally, can’t bring myself to eat them. But, when I’m sick, I like to eat them. We buy things like bell peppers when they are on sale, dice them up and freeze them for use in things like fajitas, chili, and pasta dishes. We also will buy fruit when it’s on sale and freeze what we don’t immediately eat for use in shakes, pancakes, and such. There’s a lot that can be done with frozen food, especially when you can get it much cheaper on sale and just freeze for use later. All great ideas – farmers markets are also much cheaper on seasonal produce.